I love that Precious has one blue eye and one brown eye - so cool! And she can touch her nose with her tongue! Gifted! 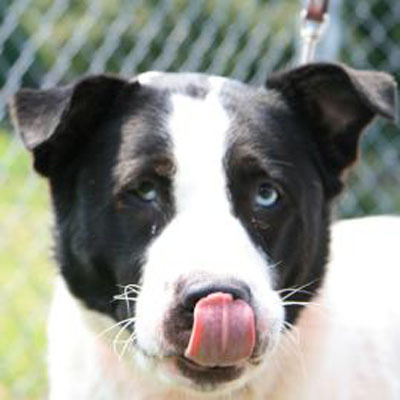 Precious is a beautiful, 5-year-old Border Collie/mix who has one blue eye and one brown eye! She’s at Lollypop Farm for a second time by no fault of her own. She spent her entire life with one family until they moved and brought Precious to Lollypop Farm instead of taking her along. She was then adopted and returned, because her second family felt she was too big. This sweet, friendly girl weighs 69 pounds and is all love! She enjoys being outside and has lots of energy for fun activities such as agility or fly ball! She's lived with children and other dogs. A home with kids over the age of 6 is suggested, and she would be happiest as the only female dog in the house. If you’d like to make Precious a member of your family, bring everybody (dogs included) out to meet and greet this cutie! Penny, the cat from last week, was adopted!